Hubud Lubud basically translates as tie and untie. In the physical action it means to connect or tie in with the first hand and then to connect or tie in with the second hand as we disconnect with the first hand. Then the first hand connects again while the second hand is again removed. This process of connecting and disconnecting continues until we stop the drill. The Hubud Lubud drill teaches the practitioner how to stay connected to another person’s arm / body (presumably the opponent) while changing positions and continually flowing and tapping. The hubud Lubud drill movement is generally tapping and staying connected with the first hand until we tap and connect with the next hand. In proper execution of Hubud Lubud there is always a connection of our hand, wrist or forearm to the puncher’s arm. Part of the intention of Hubud Lubud is to be able to feel and to some degree control the other person’s movement. The purpose is to be able to physically close off the opponent and shut them down so that we can do as we wish while they are essentially trapped. 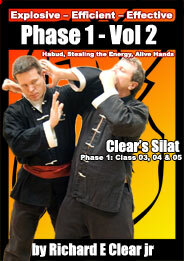 In Clear’s Silat the way that we teach Hubud Lubud is to show about 30 or so applications for specific movements in the Hubud drill. Then we use the Hubud drill to practice the flow of movements.